One of the most common questions I am asked as a DUI Lawyer is whether or not someone facing a DUI should get involved in some kind of Counseling. In a prior article, I examined some general rules about when a person should consider getting into counseling, when they absolutely ought to, and when it is really unnecessary. In that article, I examined Counseling and Treatment from a legally strategic point of view, with no reference to the actual needs of the Client. This (long) article will focus on the needs of a DUI Client relative to a potential drinking problem, and how those actual needs can sometimes seem to be at odds with the best legal strategy. I have a rather extensive background in alcohol and substance abuse diagnosis and treatment. This field of study has been a specialty of mine for over 20 years. It is this specialized knowledge that has been the basis for my success as a Driver’s License Restoration Attorney, a field in which I maintain a win rate so close to 100% that I guarantee I’ll win any License Appeal I take. It is not my experience as a License Restoration Lawyer that makes me so knowledgeable about alcohol and substance abuse maters; rather it is my knowledge of those things that makes a better License Restoration Lawyer. We sometimes confuse the notion of a “good” Lawyer with someone who is bold and aggressive. Those qualities are, on occasion, necessary when defending someone, but as personality traits they are rather standoffish. Unfortunately, the media too often gives airtime to those Lawyers who are simply brash, confrontational and loud. If there is one lesson I have learned well as a Practicing Lawyer, it is that the most successful people in any field, be it business, sales, politics or even law, are those who win people over by persuasion, and not by intimidation. Being argumentative and loud may attract attention, but it does not attract much else. I have often likened my job to being a diplomat. In a DUI case, I have to temper my Client’s hopes of simply beating the case, and I have to temper the Prosecutor’s ambition to convict the person of everything under the sun, and lock them up for it. Except for those lucky occasions when there is a significant enough defect in the evidence to get the case knocked out, I explain the realities of the situation to my Client, and I thereafter persuade the Prosecutor and the Judge to take it easy on the Client, essentially brokering a deal that both sides can live with. Part of that “diplomatic” role I play is to earn the Client’s trust, and to not offend them, or in any way put them off. This means that when I meet someone who clearly has a drinking problem, but is likewise clearly in denial, I don’t just bull-rush in and scare them off with a lecture that will only fall on deaf ears, anyway. Instead, I gauge the person’s receptiveness to the suggestion that they might want or need to look at themselves from a different perspective, and proceed accordingly. That sounds straightforward enough, right? Imagine my position, however, when, by all accounts, the person has a drinking problem, and when I know beyond any doubt that the Judge will have already concluded as much, but the Client is adamant in their denial of any problem with alcohol. 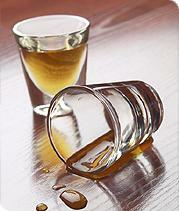 The issue of a drinking problem is often pretty obvious when a person is facing their 2nd DUI, or 3rd DUI. In 1st Offense cases, that determination is frequently drawn from the person’s Bodily Alcohol Content (BAC). Above and beyond any conclusion that I might reach, or the person’s family or friends may have already reached, the determination that matters most is the one ultimately made by the Judge. One might at first think that the easy path is to suggest that the Client get into some kind of Counseling because it will “help their case,” and thus I will have done my job, leaving the success or failure of any such Counseling on the shoulders of my Client and the Counselor to whom they are referred. Standing alone, that might be the easy thing for me to do, but does that make it the right thing to do? Let’s complicate the situation more. What if it would not necessarily be so clear to the Judge that the person does, in fact, have a drinking problem, and the person’s involvement in Counseling would not only be strategically unnecessary, but would, instead of limiting the consequences they’ll endure as a result of a DUI, essentially add more of them and will likely result in Probation will all kinds of terms and conditions? This is exactly the kind of situation that pits the “Counselor” part of my title, “Attorney and Counselor at Law” against the “Attorney” part. Which obligation is more important? The Client is, after all, paying me to make things easier, not harder. Our hypothetical situation, as described so far, involves a person that I am sure has a drinking problem. Our imaginary Client also, quite clearly, is in denial about that problem. The case presents itself as one where the Court’s perception of any drinking problem, or not, can likely be swayed to an “or not” conclusion. This presents me with a moral dilemma: Knowing, as I do, that it often takes multiple starts for a person to even begin to realize they have a drinking problem, and the earlier they begin this “awakening” process, the better, I feel, in my heart, a desire to “do the right thing” and suggest they enroll in some Counseling. On the flip side, I can see a way to walk them through the DUI avoiding any “taint” of a drinking problem, and thus sparing them being ORDERED to go to, and stay in Counseling, as well as additional burdensome, expensive and time-consuming classes and other Probationary conditions. Forget any of that “Attorney” or “Counselor” stuff for a moment. I’m not going to go off on too much of a “righteous” rant here, but our world would be a better place if people actually stepped up to do the right thing rather than take the easy road. Professionals have an even higher duty to those whom they are entrusted to help. Accordingly, in the situation sketched out above, I really have 2 seemingly incompatible goals. In essence, I have a “public” duty to my Client, and I have a “private” duty to my Client. That “public” duty, at least to me, means producing the best possible outcome in their case. It means limiting the legal consequences in a DUI. The “private” duty describes my obligation to be honest with my Client. In the example above, it does NOT, as I noted, mean just blurting out to someone who is in denial that “you have a drinking problem and you are going to need to deal with it.” That won’t do any good. Instead, it means finding the best way to plant the suggestion that the person needs to understand that, by all accounts, their situation is highly indicative of a drinking problem. I might say, for example, that it doesn’t really matter what anyone else thinks, because no progress can be made unless and until the person comes to the realization that they have an issue, and that one of the best ways for them make that determination is to stop for a moment and sincerely answer whether or not, in their heart of hearts, they don’t feel something just isn’t quite right. Is there at least some inkling that the drinking might be creating some problems for them that shouldn’t be happening at all? And let’s be candid here: Pretty much EVERYONE with a drinking problem goes through this, often multiple times, before the light switch ever flips on. I’ve seen people with 4 DUI’s who absolutely refuse to even acknowledge, at least on the outside, that anything could be wrong. It is in the hope that someday the person will actually see alcohol as the common denominator to all the troubles in their life that the suggestion that “something ain’t right” is made. The sad truth is that most people with a drinking problem never get it, or simply don’t have the strength to fight the battle. I’m all about people getting and staying sober, but I also think it is a fool’s errand to believe that anything more than a minority of people with an alcohol problem will ever get sober. Those who do are lucky, and strong, because the disease of alcoholism is most often stronger than the person who has it. That may sound harsh, but it is the cold, hard truth. Still, that minority of people who do recover from a drinking problem almost never begin that recovery at the first suggestion that something is wrong. It usually takes a lot of “suggesting” before any of those suggestions ever actually take hold. This means then, that as a DUI Lawyer, my job is to protect the Client from all the legal implications of a drinking problem, if possible, in a DUI case. As an honest and moral person, my obligation is to NOT ignore the realities of a person’s drinking situation, and gently, and in as a non-confrontational way as possible, help them to take an honest look inward, and to get outside of themselves and see how others view them and their situation. Of course, this is a lot easier when a person has begun racking up multiple DUI’s. Even the hardest hard-head will at least admit, after their 2nd or 3rd DUI, that things at least look bad. They’ll at least agree that it will look good if they get into some kind of Counseling. And hopefully, while there, they’ll hear something that will stick. I’m told that there is an AA saying something to the effect that someone who goes to a few meetings might not be ready to quit, but the words they hear will stay in their head and are likely to screw up their drinking from that point forward, and that someday (hopefully), those words will ring true with them and they’ll admit they have a problem and need to do something about it. Within the context of my DUI and License Restoration Practice, it is rewarding to deal with someone whose DUI is truly an “out of character” incident and not just a consequence of a drinking problem. Nothing, however, is more rewarding than handling a case, be it a DUI or a License Appeal, for a person who has had the insight to recognize that their drinking is problematic, and who has taken the necessary steps to fix it. In License Restoration cases, I have the absolute pleasure of representing someone who is on the upswing in their life, and is usually putting the last piece of the puzzle (the Revoked Driver’s License) into place in order to have restored not just the ability to drive, but their whole life. In the end, the title “Attorney and Counselor at Law” means being helpful to the Client in two ways that might, at first, appear to be at odds with one another, but in truth are more like opposite sides of the same coin.